When children are very young, attempts to communicate can be frustrating. Infants can’t verbally express what they want or need. Parents are often left guessing through trial and error. However, research indicates that babies are capable of communicating before they can speak; they want to tell you, but can’t yet talk, so how can caregivers cross this language barrier? The answer is sign language! Babies are capable of learning simple signs well before they are able to talk, and infants who learn to sign also have a higher vocabulary by the age of two and higher IQ by the age of eight. Even better, signing makes it easier for caregivers to communicate with their children. Who wouldn’t want to be able to talk to their baby? Simple Signing with Young Children and the Sign with your Baby Kit (DVD) is a fantastic resource about sign language. Offering tips and summarizing the latest research, Carol Gaboden Murray’s book provides everything you need to start teaching your baby to sign, while the signing kit provides live examples. This is one of Baby’s favorite words. More milk, more playtime, more cuddles! To make this sign, bring your hands together and tap your fingertips repeatedly. The sign for “thank you” is easy! Start your hand at your lips and move it outward. To make the sign for milk, open and close your hand repeatedly, as if milking a cow. If Baby is thirsty, they can sign for water by putting a W (three fingers) to their lips. 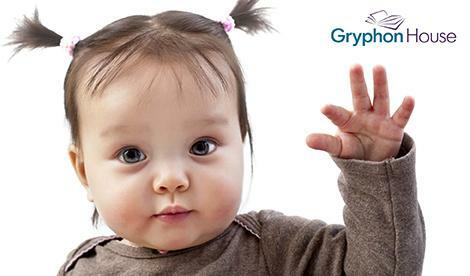 To indicate that being done with food, water, or playtime, start with your palms facing up and then flip them outward. How can babies sign your name? By keeping their hand open as they press their thumb to their chin and wiggle their fingers! How can babies sign your name? By keeping their hand open as they press their thumb to their forehead and wiggle their fingers! Love of reading starts early! To sign book, open and close your hands in front of you as if opening a books.